When experiencing scalability issues, isolating resources can be a way of extending workloads in the cloud. An alternative solution for scalability issues is to use a multi-tier backend database internally connected to the application frontend. This guide walks you through the process of enabling a Virtual Net (VNet) peering which makes an internal connection between a frontend stack (in this guide we will use a Bitnami WordPress as an example) and an existing backend (a sample MySQL with replication) both deployed in different resource groups. This guide focuses on enabling a VNet peering which internally connects frontend and backend stacks belonging to different resource groups. For the purposes of demonstration, we will use a WordPress and MySQL with replication deployments as an example. You have an account in the Microsoft Azure Cloud. 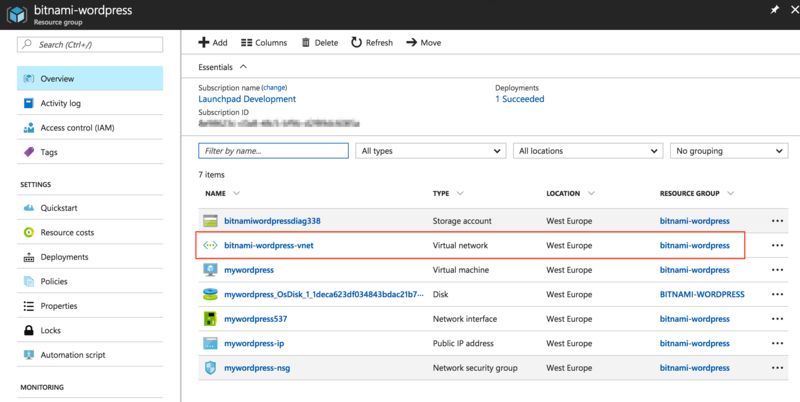 You have basic knowledge about the elements that make up the Azure Resource Manager (ARM). For more inforamtion about the ARM, see the Azure official documentation. You have a multi-tier solution running in an existing resource group, or you have created a new one during the deployment. (In this guide, we use a MySQL with replication deployed in a resource group named bitnami-mysql). All the resources have been launched using the ARM, and not the classic deployment mode. Learn how to check your deployment model. 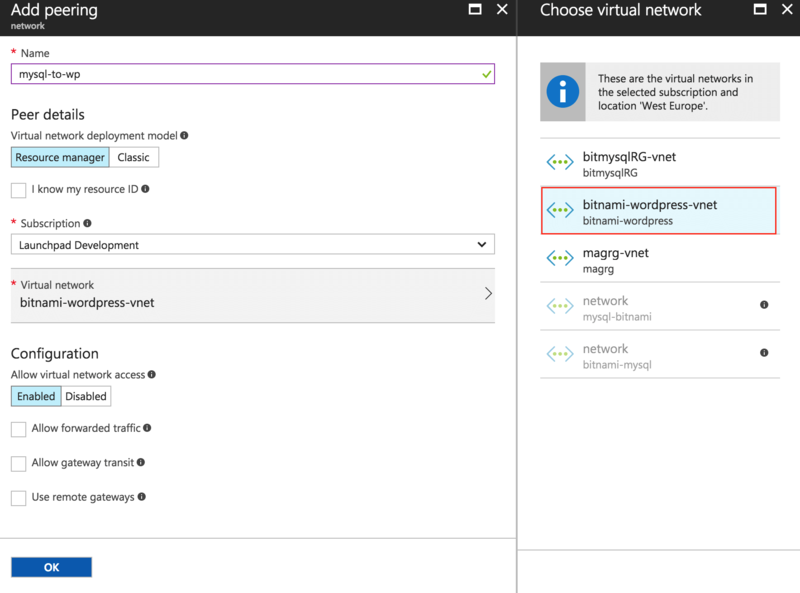 The new deployment (in this guide, Bitnami WordPress) must be launched using the same subscription and region (location) as the existing one but belongs to a different resource group. 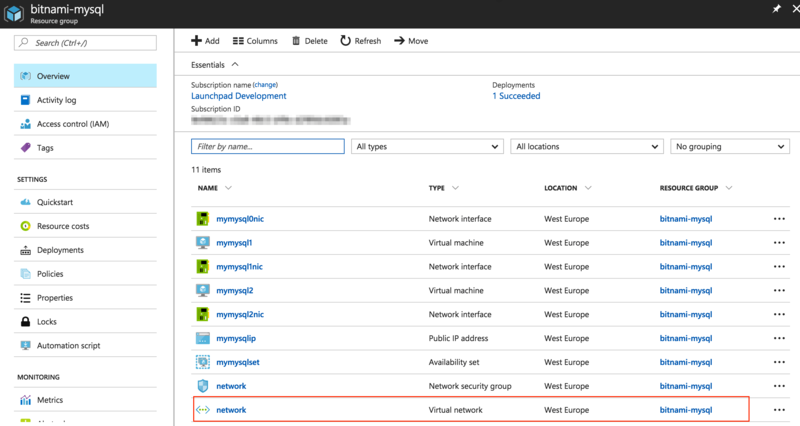 NOTE: If you have launched an application and a database in the same resource group, see our guide on how to share a virtual network to link different instances from the same Resource Group . Log in to your Microsoft Azure account. You will be redirected to your dashboard. In the left-side menu, select “New” and in the marketplace search box, enter “WordPress Bitnami”. Click on the first result. You will see the application description on the right side of the screen. To create the new virtual machine, click “Create”. Enter a name, VM disk type, user name, authentication type, and password. In the Subscription field, select the same subscription as the existing multi-tier database. In the Resource Group field, select the “Create new” option and enter a name for the new resource group. In the Location field, select the same location that you entered when deploying the existing multi-tier database. To finish the application deployment, complete the remaining steps. Once you have the application deployed, you can enable the VNet peering to connect to the existing multi-tier database. In the virtual network panel, go to the left-side menu and click “Peerings”. Enter a descriptive name for the network peering. 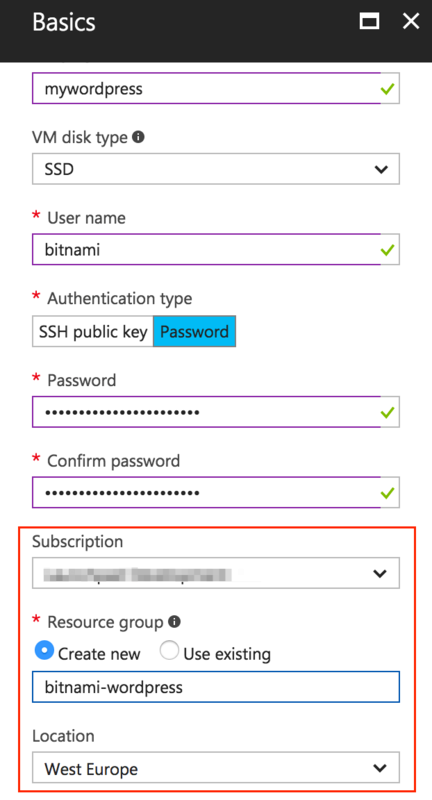 Select the same subscription that you selected during the application deployment. In the “Virtual network” section, select the virtual network of the existing multi-tier database. Leave the rest of the sections with the default values. To complete the process, click “OK”. You should see the recently created VNet peering in the list of the associated peerings to the virtual network of the application. Ensure that the peering status is “connected”. Select the same subscription that you selected during the database deployment. 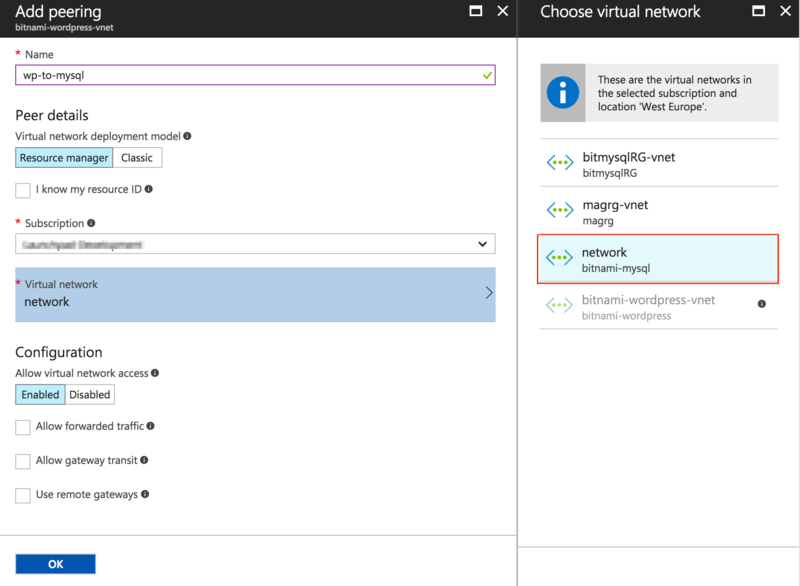 In the “Virtual network” section, select the virtual network of the application. Leave the rest of the sections with the default values. To complete adding the peering, click “OK”. Connect to the WordPress application server through SSH. Learn how to connect to the server with an SSH client in our FAQ. Once you have connected to the frontend server, the next step is to connect to the backend database (MySQL with replication). You will be prompted to enter the root user password. This is the password you entered during the database deployment. To use the new multi-tier database as the backend of the application, you must migrate the current WordPress database and specify the new IP and credentials of the remote database. 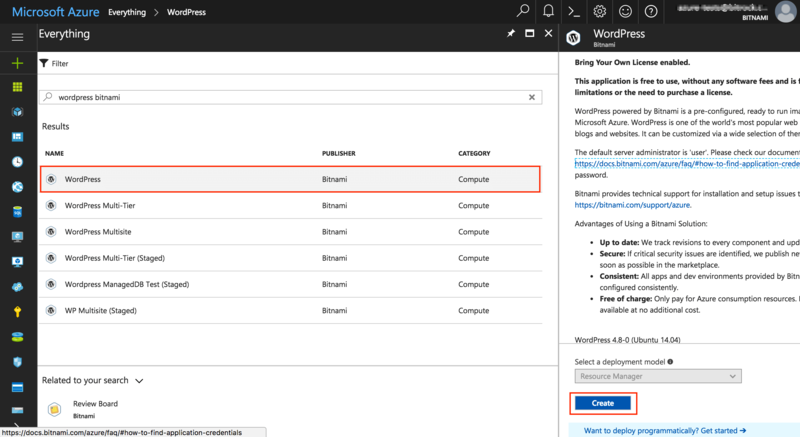 Learn how to migrate the current bitnami_wordpress database to the new remote database by following the how to create a database backup and restore it sections. To specify the new database IP and credentials, change these values in the /opt/bitnami/wordpress/wp-config.php file.